Dear Starbucks, I’d really like a better cream cheese please. 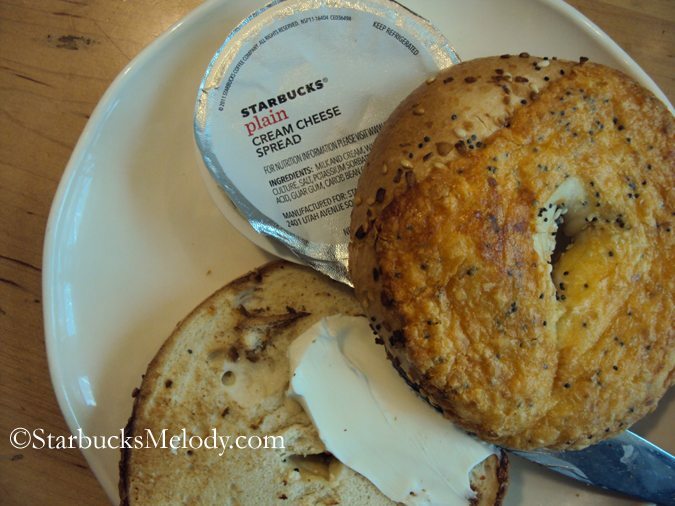 In the mornings, I like running into Starbucks and grabbing a Chonga (cheese, onion, garlic) bagel with cream cheese. I’ve enjoyed that for a long time. Last fall, Starbucks changed the brand of the cream cheese that they offer. I will say, it seems to be in a slightly larger container than before, but I’ve never fallen in love with the new cream cheese. It’s just a bit bland. I’d really like a better cream cheese. In the big scheme of things, it is cream cheese. Am I going to stop being a Starbucks customer over a small container of cream cheese? Heavens no. I had the momentary thought that I could start a petition to try and get a better cream cheese, but somehow that seemed just silly. But I think Starbucks could do better. The current cream cheese lacks a rich flavor, and has an odd texture. A long time ago, Starbucks offered Kraft Philadelphia Cream Cheese. That was a delicious cream cheese. Since Starbucks ended their marriage with Kraft (meaning Starbucks sued to end their contractual relationship), we won’t be seeing that cream cheese make a come back. I realize that the issue of the cream cheese is a very tiny detail of a much larger picture of what goes on in the stores. But they say, “retail is in the detail” and shouldn’t a delicious bagel have the best cream cheese possible? I wondered if anyone else has noticed the cream cheese too? Am I alone in my cream-cheese-disappointment? Share this blog post if you want the cream cheese to change! Maybe we can shine a small spot light on the cream cheese! Thank you for listening Starbucks! Melody I am not someone that likes cream cheese so I cannot speak to the taste good or bad, but I understand what you are saying. I think your comment retail is in the detail says alot and if I may open it up a bit I would not mind seeing a really nice jelly pack being added to the line. (a high grade one with taste of course). I wonder if SB has seen the their sales of cream cheese gone down since the switch? It is true that the quality of cream cheese greatly alters the taste of bagel. I also would love Starbucks to bring back the previous cream cheese. Sharing your post. 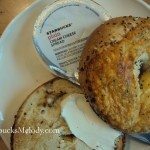 I have rarely had the cream cheese and bagel at Sbux so can’t speak to its quality. However, considering so many other changes at Sbux, I would believe you that the quality has declined. @Melody — as I have commented on MSI that the “new” cream cheese horrible; both regular and low fat; gritty, waxy, no tang, poor spreadability, and more negatives. Starbucks is not listening. There is no rabid cream cheese movement. We just move on. Unfortunately this is a direct result of Starbucks acrimonious split with Kraft. Kraft’s Philadelphia Brand Cream Cheese Products are considered the mass market gold standard in cream cheese. Sure there are excellent local varieties, but when it comes to international distribution Kraft is it. Maybe we need to get 6,000 people to sign a petition (worked for beetles), but the bottom line is unless someone at Starbucks eats crow and begs forgiveness you will not see a good cream cheese or a lot of other good products at Starbucks. Starbucks is not the big dog they are trying to portray. I must also add, that once again Starbucks is diluting our Starbucks Card benefits by offering anyone a free tall with a pound bean purchase. Starbucks would be far better off to decrease bean prices at least $4.00 which is, I bet, the average price of the “free” tall. Howard, hear that whisper in the wind, it is the Entrepreneurs making real espresso and real food in a true third-place atmosphere. Hope that China thing works out for you. Retail is in the detail per “The Starbucks Experience” as I am reading the book currently and it seems a LOT of products in the book are no longer around. Starbucks responds to feedback so I wouldn’t give up just yet and maybe there is a nice gourmet cream cheese mom & pop shop out there just waiting to be discovered for their product’s taste and texture. I am still mad over the Peach Green Tea Lemonade not being in ALL stores but it is on their website……pffffft. @DadCooks It probably wasn’t the 6k signatures that ended up being the thing that Starbucks responded to. It was the news! If you end up in mainstream news everywhere, that catches their attention. Sometimes I’m curious how that happens that a story gets picked up across the country, but in any case, it would have to go viral! I wonder about the one barista who discovered the bug-coloring in the strawberry mix. I don’t think she did anything wrong, but I wonder if Starbucks is irked with her? There is no way to know, so I don’t expect any answers. There was a short promotion of buying a pound of beans and getting a free drink – but since it was just a short promotion, I don’t think of it as a dilution of perks. I truly hope Starbucks is NOT upset with the barista that “discovered” the bug coloring because if she can read a label then others can too and one person cannot make the story go viral. LOL Starbucks has to know the MAGNIFYING GLASS on their company and practices will never go away and with social media the glare from the spotlight gets even brighter. I do LOVE the fact that they RESPONDED and made the change even though so many other companies are using the same bug coloring and they get a pass. I really wish Starbucks would just go ALL NATURAL on their frapps and not worry about the coloring. Their customers would lead the way and be appreciative I am sure. I like the idea of SB going natural and maybe combine the food choices of food evolution cafes into the regular SB stores. Maybe that would mean finding a better cream cheese? @Melody — That “short/limited” promotion returned to the chalkboard at my regular Starbucks this week making it not so limited or short 😉 . Since this is an open thread, I thought I would mention an amusing interchange I saw yesterday. A customer came into SB for the first time ever to any SB store and she was totally confused as to how to order the drink and then once received where to go to put milk, etc. into her cup. The partner behind the counter serving her was sort of taken aback that there was actually a customer that was never in a SB store. What sort of bothered me a bit was that the partner got a bit peeved that she had to spend a bit more time with this person. I actually showed her where the condiment station was. I actually thought I wonder how many other new customers were confused by the process and if partners reacted that way how would that look? It was not crowded at the time. I thought perhaps in some way maybe SB needs to put up a sign to let newbies know how ordering and getting your milk, etc. works. Of course, most stores are not huge where a new customer cannot see where the condiment station is, but the interchange was interesting to watch. Cream cheese just has to taste good to serve it’s purpose. I think the scones are very lacking in taste too and don’t buy them anymore. Now I can also bring up my rant about the mocha powder being discontinued. They’re pushing the liquid semi sweet and bittersweet in the starbucks online store. People hate the semi sweet and a few are saying the newer bittersweet is better. I don’t want to buy a huge container of the sauce with a short pump (also a problem). I want the mocha powder back. I don’t buy bagels at Starbucks (except the times I have for my kids), but I see an opportunity here for Starbucks to do something unique. Panera is a competitor and they have good cream cheese. So do many others. Starbucks could do this – either with an in-house brand like Panera does, or by partnering with another company. There’s a great little cheese shop in the Market just a block or so down from the original Starbucks (sandwiched between the original location and the “Heritage” location). Perhaps that cheese shop has a great cream cheese that Howard could help take national. I’m not a fan of the new cream cheese at all! I think it takes disgusting. As a partner, and a frequent bagel buyer, I actually bring my own cream cheese from home and keep it in the fridge. I would love if they changed it to something more delicious. @Denise – Did you see my comment to you on msi, about the upcoming 10 yr. remodel, at another Starbucks I frequent? Yikes…. I will keep my fingers crossed on that one. We still have Philidelphia cream cheese. Having said that….I want the chonga bagel! There is no better cream cheese than Philadelphia. Enjoy it every morning. I think it was a big failure for Starbucks to end their partnership with Kraft. @chgo: I did see that! That will be interesting…..keep your eyes out for a permit! I do wish you would get over to my place and take a look. it’s so incredible 🙁 and they’re still trying to (minimally) “improve” it. When the contractors came BACK to install the lighting and part of the ceiling (very high warehouse type ceiling so they were addind a lowered section, above the long “computer” table) they …I am told…did much of their work while standing on the table, then dropping a heavy drill onto the table which took a chunk out of the edge of it…the table, and also left a drilll bit mark or two. The largest damage to this NEW 🙁 table is now covered in masking tape! and, I learned all this from talking with a carpenter who was in to evaluate and measure for repair. He also told me other things about the cheap tables and chairs,….the ones that have either already split and been removed (chairs)…..this is Mexican Pine….and the tables that are in the process of splitting in various places. oh….it just goes on and on and on….. Living in the Philadelphia area I have always eaten Philadelphia cream cheese. The new cream cheese at Starbucks has a taste I can only describe as BLECH! @Suzanne – Glad I am not alone! I got a couple of twitter responses from people who don’t like the new cream cheese, but as you know, most folks don’t click through to leave a comment. But I am sure there are lots of us who don’t like the new cream cheese! Sorry to be the naysayer here, but since we’ve switched cream cheese at my store I haven’t had a single complaint about the quality (I enjoy an occasional Everything Bagel, but only with butter, not cream cheese). In fact, I’ve had multiple compliments about the increased portions and the ‘Light’ option too. My bagel sales are constantly on the way up, with only a few complaints about the fact that we eliminated the old Asiago Cheese Bagel. While I’m sure a small percentage of extremely discerning customers can tell the difference, to the vast majority this is a non-issue. Chris, you know I’m okay with naysayers. I don’t like the new cream cheese. But in the big scheme of things, the cream isn’t going to be a deal breaker for most ANY customer at Starbucks. Probably most people won’t bother complaining – too trivial an issue so I do think there are others like me who don’t like the new cream cheese. 🙂 Taste is subjective! I don’t even remember the old Asiago Cheese Bagel – I’ve always leaned towards the Chonga Bagel. Always good to hear your thoughts my friend. @Chris W — the only Asiago Cheese Bagel I have seen has been at the licensed Starbucks, most prevalent at Barnes & Noble. B&N is also still serving Philly Cream Cheese, both regular and low fat. At my regular Starbucks, the word from the Partners is that while Bagel sales are up since the return of the Chonga Bagel, cream cheese sales are way down and predominately the low fat version. The Kerrygold butter is more popular than ever, particularly since it is “free”. I personally prefer the reduced fat version of the cream cheese. Its creamier, and has a better taste. Yes! The cream cheese at Starbucks needs some work! I prefer to get bagels and cream cheese at Panera. But their coffee stinks……wish we could combine the two offerings in one store. I would actually like to know who makes their cream cheese currently, because I find it absolutely amazing!! It has the most BITE out of any cream cheese I’ve ever tried. When I first became a partner (employee) at Sbux years ago, I hated cream cheese. Then I had theirs, and I was a fan. Had my first bagel and cream cheese at SB in YEARS just now. I’m in New Orleans and a close store opened several months ago. When I lived in Seattle, I craved the Chonga bagel with Philly cream cheese. This everything bagel tasted weird — what is that cheese on it? The cream cheese is gross. Just gross. I will never order another one at SB and now, based on comments here, I’m tempted to try the bagels and cream cheese at Panera.